One of the leading alternatives to cut flowers is live plants. Plant baskets offer a touch of color that lasts longer than blooms. With proper care, they can live for many years in a home or office. 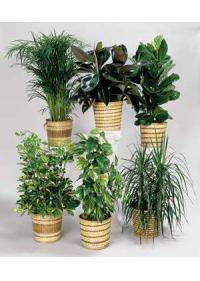 Potted Plants have been increasingly popular in areas around Palmdale, CA, Berkeley, CA, Irvine, CA, Carlsbad, CA, and Torrance, CA. They can be used for almost any occasion or event and come in a variety of sizes and species to fit anyone's tastes. As such, potted plants make for a very popular gift that can still be very memorable. The most important part of any live basket is the container. Without a good container, dirt and water can leak out onto tables. This can create a mess, and can ruin the appearance of baskets. A good container will have an inner layer that offers protection. This is typically a plastic liner, such as a clear and thick insert. This prevents excess water and dirt from falling out from baskets. The liner is hidden by the plants, as leaves typically cover it up. Some may choose to use a deeper container, or one with a large rim. This is another simple way to hide the protective liner from sight. Basic houseplants are among the first used for any live assortment. They are easy to care for, and often have a very long lifespan. These offer a showy display of leaves that many find enjoyable. Some green assortments may include shaped designs, such as topiaries. These are plants that have been carefully shaped into a design. Common options are hearts, balls or open circle greenery designs. Topiaries make a striking display when used as a living gift. The shapes make for a bold focal point, ideal for a desk or table. They do require some upkeep, which is important to keep in mind. the upkeep on a topiary extends beyond basic watering needs. Over time, it may lose its shape unless it is trimmed regularly. This may mean a trim every month, or every other month for some species. Bonsais are another green plant design that requires minor upkeep. These miniature trees require basic trimming in order to look nice. Without it, they may begin to look crowded or overgrown in the pot. The rate at which bonsais grow often depends on the species used. Some grow very quickly, while others may take months to grow. Other considerations include whether the bonsai flowers or not. Green plants can be given as gifts on nearly every occasion. Some occasions, however, stand out as being more popular for them. Two of the top occasions are housewarming and condolence baskets. These two occasions are popular as they provide a lasting gift. The greenery can be re-potted and kept as a houseplant for many years. This is often kept in mind when looking for the perfect arrangement. Romantic events may also offer a chance to use green baskets. For special events, such as an anniversary, flowering greens can be used. These are typically given in addition to any cut flower arrangements. When giving plants, it is important to remember that they need care. At minimum, they will need regular light and water in order to live. If kept for a long time, they may eventually need to be re-potted.